Deepwater Horizon’s success as a film is in its very name. The decision to focus on the blowout of the rig and the people trapped aboard was brilliant. 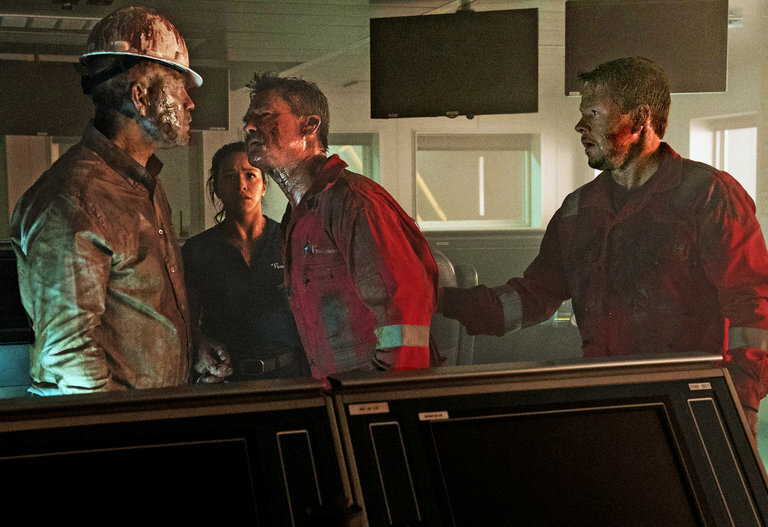 Like most disaster movies, you know what’s going to happen, but that doesn’t stop Deepwater Horizon from being a tense, suspenseful, and unpredictable action movie. The entire blowout scene, from the small cracks shown miles below the ocean’s surface during the course of character dialogue, to the protagonists’ increasingly desperate attempts to avert the impending catastrophe, to the spectacular towering inferno that inevitably results, is masterfully directed by Peter Berg. Replica of the Deepwater Horizon in New Orleans. The film slowly ramps up the tension and the terror remains in overdrive until the final petroleum climax. This palpable tension turns the fiery rig into a treacherous dying monster determined to take as many crew members with it as possible. Mike Williams (Marky Mark) tries to navigate through the dark, smoky bowels of the rig, saving as many people as he can. The blazing, gnarled wreckage is an impressive sight, particularly because the production crew took the time and effort (85 welders took eight months) to build an almost life-size replica of the Deepwater Horizon rather than lazily use CGI (Ward & Crooks). In addition to the stellar visuals and remarkable set, Deepwater Horizon excels with its cast. It’s relatively easy to put actors in dramatic disaster scenarios (see, San Andreas, 2012, The Day After Tomorrow, etc. ), but it's more difficult to make us actually care about their wellbeing. 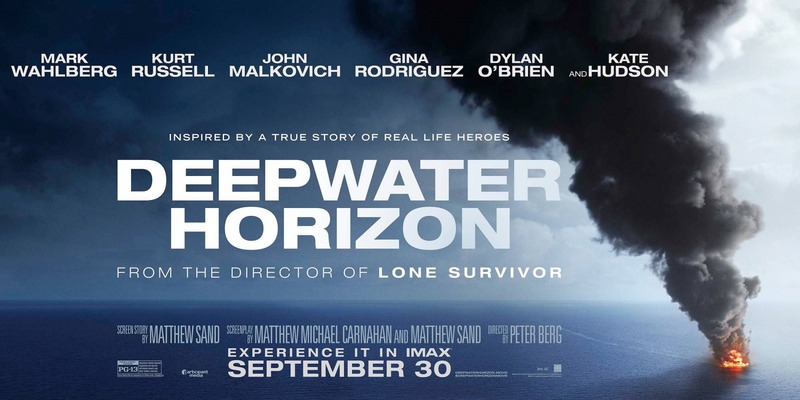 Deepwater Horizon manages to pull this off despite all of its characters lacking any real depth. Our lead and audience surrogate, Marky Mark, plays Mike Williams, an electronics technician aboard the Deepwater Horizon. He’s portrayed as a loving family man who is desperate to survive the blowout in order to see his wife (Kate Hudson) and daughter again. You could cut William’s family-subplot from the film entirely and still lose nothing. Nevertheless, Marky Mark, exudes his typical likable charm and affability, busting other co-workers’ chops, being quite capable at his job, and above all being a loyal and courageous friend when he’s needed most. The rest of the cast is just as relatable and rounded out nicely by what seem like everyday hardworking people put in a terrifying scenario. Kurt Russell’s performance as Jimmy ‘Mr. Jimmy’ Harrell also deserves mention. Mr. Jimmy seems to be the highest-ranking non-executive aboard the rig and is as tough as a two dollar steak. Adamant about getting BP’s ignorant executives to perform basic safety tests, Mr. Jimmy can barely hide his seething contempt for them. The human element in this film works so well because it displays a ‘salt of the earth workers’ vs. ‘evil corporation’ dynamic. The film absolutely excoriates BP for their greed and their concern for cutting costs before human lives and safety. The BP executives on the rig are led by Donald Vidrine (John Malkovich), a slimy and deplorable man whose words ooze out of his mouth like a puss. Malkovich does a good job portraying Vidrine as a faux and almost fawning genteel oilman. Malkovich almost overdoes the southern accent but it only makes him even more despicable somehow. The film asserts that this disaster could have been avoided if Vidrine and BP had followed basic safety protocols. Much of the working crew derisively calls the Deepwater Horizon, ‘the well from hell’, and upon being asked by Vidrine, Mike Williams lists dozens of systems that are working improperly. Phones are assumed to not work, computers constantly crash, smoke detectors and alarms either don’t go off when they should, and the rig is said to be held together with “bandages and bubble gum”. BP valued profit and greed over their machinery’s structural integrity, precaution for the environment, and even basic human safety. As a result, 11 men died and over 210 million gallons of oil flooded into the Gulf of Mexico for over 87 days. Deepwater Horizon is a taut disaster movie filled with tense, exciting action sequences. This is achieved by the use of impressive real sets in combination with CGI and factual information from survivors of the blowout. It even uses the ‘shaky cam’ in places that were actually applicable! Imagine that! In addition to its gripping action and intense drama, the film also succeeds in making the cast relatable or hateable. While the characters are simple stock composites, they are humanized enough to relate to and care about. Our empathy for the working class cast is helped greatly when pitted against the gross negligence and incompetence of the executives of BP. The film thus provides a secondary antagonist to compliment blowout, and more reason to root for the movie’s heroes. The film ends on a somber note showing real archival footage and photos taken from after the disaster as well as an epilogue that memorializes the lives lost. Deepwater Horizon is a surprising gem in the midst of few good film offerings at the moment. Give it a watch. TLDR: Deepwater Horizon is a fantastic disaster movie dramatizing the true Deepwater Horizon oil blowout and explosion of 2010. 4/5 Stars. Ward, Andrew, and Ed Crooks. "BP Gives Deepwater Horizon Disaster Film a Scathing Review." The Financial Times. Financial Times LTD, 30 Sept. 2016. Web. Oct. 2016.